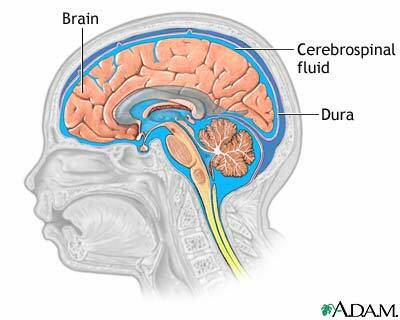 Cerebrospinal fluid is the fluid found in and around the central nervous system (CNS) organs, the brain and spinal cord. It protects the brain and spinal cord by acting like a liquid cushion. The fluid allows the organs to be buoyant protecting them from blows or other trauma. Inside the skull the cerebrospinal fluid is contained by the dura which covers the brain. Any trauma or tear in the dura can allow the fluid to leak out creating an emergency situation.